Out of the Wood Work Construction - Builder, Carpenter, Plasterer, Rubbish/Waste/Clearance based in Wimbledon, Greater London. 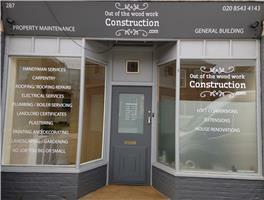 Out of the woodwork construction are based in Wimbledon but work in all local areas. Having been in the business for well over 10 years with a combined experience of over 30 years we have now expanded to offer a wider range of services out of the convenient Wimbledon based office and workshop. A friendly workspace for our colleagues where appointments and walk ins are welcome, even if you just want to meet the team. We are here to help you with all aspects of construction, maintenance and renovation. With all types of jobs undertaken, we have specialist tradesmen for all your needs and requirements. Our photo gallery demonstrates the different types of works already undertaken and with customer service and communication at the heart of what we offer you won’t feel disappointed. A project manager for every job will ensure you have clear and fast responses to any questions and worries you may have, making the job run as smoothly as possible and putting your mind at rest.